Even though susceptible to natural fluctuations of the U.S. economy, the construction industry never goes out of fashion. Building, reconstructing and servicing houses, office spaces, and public facilities is surely a field that will always be of high priority for the U.S. society. If you are considering construction as your future vocation, you have plenty of reasons to feel hopeful – and get started with your new endeavor with zest. Earnings in the field have been going up in recent years, together with increased demand for construction services. Construction managers make on average $78,483 per year, while specialty contractors such as carpenters and painters earn on average around $50,000 per year. Naturally, you will have to learn the steps on how to become a contractor, so that you launch your business successfully. You will need to start with gaining sufficient knowledge and practical experience in your general or specialty construction field. The next step would be to take care of administrative tasks such as registering your company and obtaining your state license and contractor license bond. You’ll need to craft a business plan, obtain the necessary equipment, and start expanding your business network to build your customer base. As in every profession, it’s a wise idea to also keep learning the novelties in your trade, so that you stay on top of your game. If you’re ready to start making your dream a reality, here are the most important tasks you need to take care of. They are the prerequisites that allow you to launch a winning contracting business. For some people, construction is a lifetime vocation that starts as early as high school and the first summer jobs. In case you don’t have previous experience, though, you can seek a contractor school program on how to become a general contractor, or seek a specialty training course if you want to take the path of an electrician, plumber, or similar specialist. The contractor training can give you knowledge in areas such as construction materials, financing and budgeting, and even business strategy. In the majority of cases, you would need to undergo solid training and then follow an apprenticeship for a few years. This is how you can earn hands-on experience in your specific trade, learning both practical and business aspects from proven professionals. In fact, most states have detailed requirements about the years of experience for each contractor type, as well as for training, certification, and apprenticeship programs. You would need to find out the exact criteria in your state and make sure you satisfy them prior to applying for a license. The training you get will also help you get familiar with the most important construction regulations in the U.S., such as energy efficiency standards, handling hazardous materials, ensuring workplace safety, and more. Bonus tip: Most states would require you to pass a business test and a specialty test that prove your suitability for running your contracting company. Get ahead by learning the general principles of your trade during your apprenticeship, as this will give you an advantage later on. After you choose the structure that best suits your situation in terms of liability and taxes, and come up with your preferred company name, you have to register with the respective authority in your state. Bonus tip: If you are planning to employ people, you will be required to comply with the rules of the Internal Revenue Service and obtain an Employer Identification Number (EIN). Bonus tip: Many training programs include preparation for creating a solid business plan. This can be of immense help if you’ve don’t have previous experience in business planning and strategy. Every state sets different criteria for obtaining a general contractor license and for specialty licenses. You can refer to the National Association of State Contractors Licensing Agencies, where you can find the exact body that is in charge of the contractor licensing process in your state. That’s how you can easily find out the specific state requirements that apply to you. Usually, states separate two main categories of licenses. There are general contractor licenses, which allow contractors to engage in a residential and commercial building. Special trades have separate license types, such as electricians, plumbers, HVAC contractors, roofing specialists, and many more. The classifications vary greatly from state to state. In addition to meeting the licensing criteria, you will have to pay licensing fees, as required by your state. They may be required on an annual or biennial basis, depending on the period of your license. At such regular intervals, you will also have to renew the license and provide all paperwork to extend its validity. Bonus tip: Some counties and cities may also have requirements for contractors. Make sure to check with your local authorities if they have other criteria you need to meet before you start your operations on their territory. One of the important general contractor license requirements, which often is among the specialty trades criteria as well, is obtaining a surety bond. This is a security mechanism that is often required from professionals in order to guarantee their legal compliance. Surety bonds are used in construction very often – and there are two main types you should keep in mind. The first type of bond that you will need when starting your construction company is contractor license bonds. They are necessary when undergoing your licensing process with state authorities. The bond functions as a guarantee that you are a suitable candidate for a construction licensee. It ensures you will adhere to the law in your activities as a contractor. If you want to bid on public and private projects, you are likely to also need contract bonds. They are required on a project basis and protect the project owners. Contract bonds guarantee that you will execute the contracted work on time and in the agreed quality. Surety bonds don’t protect your business – they are a safety net for the state, your customers, or project owners. If you fail to follow the law or to deliver on your contractual obligations, you can end up with a claim against your bond. This is how harmed parties can seek fair compensation for the damages they have suffered as a result of your illegal activities or default on construction work. As you are fully liable for all claim costs, it’s best to avoid actions that can lead to problematic situations. Bonus tip: Your surety bond cost depends on the strength of your personal and business finances. If you want to pay less for your bonding, make sure you clear out outstanding payments and polish your credit report prior to applying for a bond. When it comes to construction equipment, the spending can go in the millions. In the same time, you cannot start your operations without ensuring you have all the tools you need for doing your job well. Balancing between finances and needed equipment can be tough, but there are variants to handle it: you can hire tools at first, or negotiate a borrowing deal with fellow contractors. The best option, of course, is to purchase everything you need. For this purpose, it may be worth looking into external funding in case you don’t have initial capital at hand. Don’t forget you’ll also need a solid construction management software. It can help a lot, especially if your team is rather small and has to handle numerous tasks at once. There are a number of good options on the market, so you’ll need to select the one that best fits your trade and specific business needs. Bonus tip: If you’re looking for equipment investments for your business, you may want to consider the Small Business Administration’s Loan Program. Other options for funding include getting a business line of credit, a loan from a community bank, or joining a credit union. A major point in a solid business plan is how your construction company would advertise its services and find customers. Making a name in your field is essential, and you should start working on it from day one. You should allocate resources for your marketing efforts – whether in-house or outsourced, so that you build up your construction brand. It’s important to also forge good relationships, both among your peers and with current and potential customers, who can refer you to other people too. Joining industry associations is also a wise step in this direction. Bonus tip: Industry events are a good way to meet fellow professionals and potential project leads, as well as to expand your knowledge in your trade. Don’t miss out on frequenting conferences and workshops. The construction field evolves constantly, with new building materials and methods getting ever smarter and more efficient. The same goes for the way a business can be managed. This means that if you want to run a successful contracting company, you have to stay on top of the newest knowledge and trends in the field, as well as of management styles and business strategy. Continuing education is a must for that end. In addition, your state may require you to take new training every time you renew your contractor license. Bonus tip: You can seek a contractor certificate program if you want a less intensive training option. If you want to ace your skills, however, you may also consider an associate contractor’s degree or a Bachelor’s degree from a university that offers such programs for contractors. Launching your construction company is a lengthy process, but knowing the steps helps a great deal in their realization. 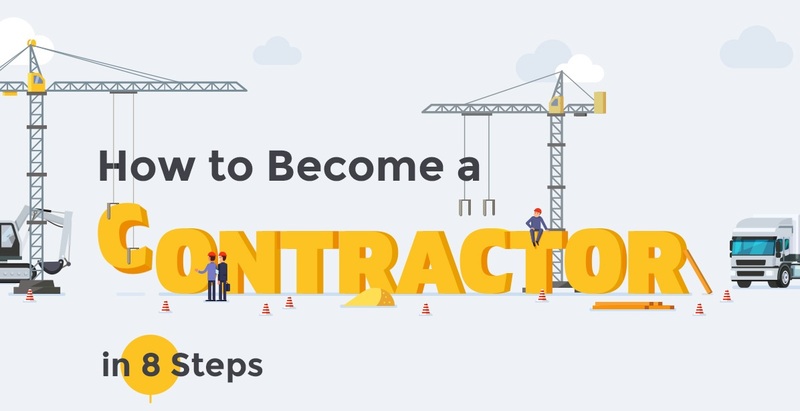 The actions listed here apply to most contractors in the U.S., so they give you a good rough idea of the procedure you will need to follow to start a successful contracting business. We’ve summarized the 8 steps above in an infographic format. Have a look and share it with your peers. If you want to embed it on your website, feel free to use the embed code below it!